Problem 1. A motorboat starting from rest on a lake accelerates in a straight line at a constant rate of 3.0 m s-2 for 8.0 s . How far does the boat travel during this time? Which of the three is traveling the fastest? Are all three ever at the same point on the road? How far has C traveled when B passes A? How far has B traveled by the time it passes C? (iv) B passes C at 0.7 hours. During this time B covers distance of 6 km. Problem 3. A ball is gently dropped from a height of 20 m. If its velocity increases uniformly at the rate of 10 ms-2, with what velocity will it strike the ground? After what time will it strike the ground? Problem 4. 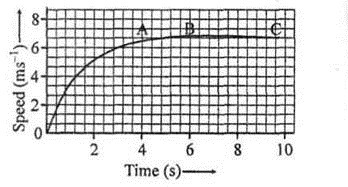 The speed-time graph for a car is shown is Fig. 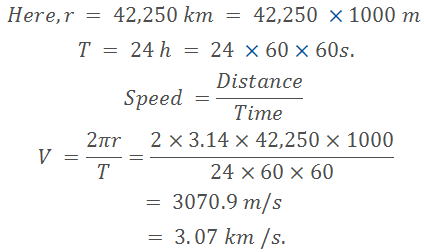 (a) Find how far does the car travel in the first 4 seconds. 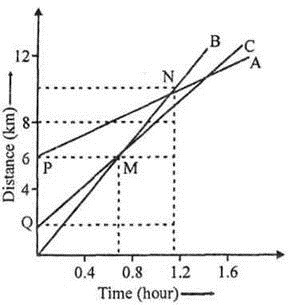 Shade the area on the graph that represents the distance traveled by the car during the period. (b) After 6 s, the car has a uniform motion for straight part of graph BC. 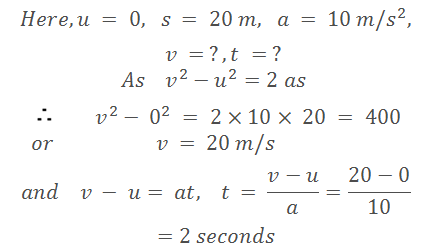 up, at highest point its velocity is zero but it has acceleration equal to acceleration due to gravity. (b) Yes, when an object moves on a circular path, it has centripetal acceleration which is perpendicular to displacement. Problem 6. An artificial satellite is moving in a circular orbit of radius 42250 km. Calculate its speed if it takes 24 hours to revolve around the earth.